Fourteen women met at the home of Dorothy and Ed Hinshaw in Sumner. The women were served a lovely “High Tea” by Ed and grandson Chris that included delicious sandwiches, fruit and sweets. Sally Skillman presented devotions and shared excerpts from a book of poetry, “On the Pulse of the Morning,” by Maya Angelou. Jo-an Jacobus presented the program from Blueprints on the topic of courage. She encouraged the women to share their own examples of when they observed others showing courage or how they themselves found the courage to move forward in difficult times. We signed cards for numerous Friends here and not so close to home. Prayers were requested for Dale Graves in Belize. Theresa Oleksiw presided over the business meeting. The minutes of the last meeting were read and accepted, as was the treasurer’s report. Jo-an presented suggestions for new books for the 2014 Adult Reading Program. It was recommended that we not purchase new children’s book this year, readership is down and there are plenty of wonderful books in the library to circulate. Sally suggested that someone at meeting make a regular announcement about the reading course. It might be helpful to have a separate table for these books. Nominating committee report is as follows: Angie has agreed to be secretary again and Margaret has agreed to be treasurer. Dorothy Curtis agrees to be vice-president. Kitsie was not present tonight; Dorothy will ask her if she is willing to be president again. The program committee needs new members. There was no report on the last Tedford meal. The annual August “Eat-Out” will be on Aug.18 at Petrillo’s in Freeport. Sarah Sprogell will notify the restaurant and get more details. Clarabel Marstaller brought forward a concern that Marian Baker and Ann Armstrong need help putting out the New USFW newsletter. If interested please talk with Clarabel. Next month’s meeting will be held on July 21 at Helen Clarkson’s home. Theresa has devotions and the program. 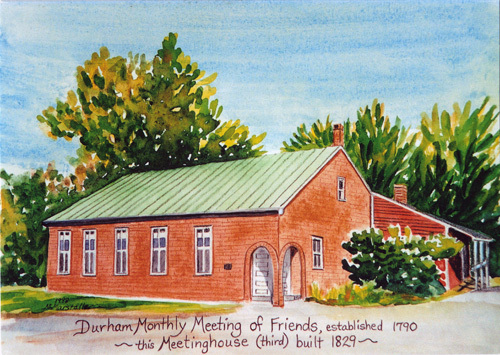 A suggested topic for next month was a discussion of the future of Women’s Society Meetings at Durham Meeting. Sally suggested that the annual financial report for Women’s society might use a “pie” format which is simpler for some to understand. Theresa closed the meeting reading from Psalm 100, reminding us of many beloved members who have died in the past few years. This entry was posted in Woman's Society News and tagged July 2014. Bookmark the permalink.